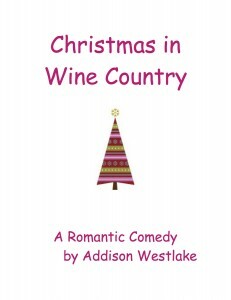 Christmas in Wine Country is almost a coming of age story for the main character -- Lila. Even though she isn't exactly coming of age, she is finding herself again, and not in the place that she had imagined she would end up in. This story will take you on a journey from happiness, to heartbreak, and back again. It is full of emotion, and is written to make you feel everything that is happening. Lila finds herself leaving the corporate world after a .... mishap at the company's Holiday party. After settling down in a sweet little town she decides this is where she was meant to be all along. After settling down comes task number 2 of finding someone to settle down with. Through all the pain of dating and falling in love comes a magical story of romance that will keep you flipping the pages of this book to find out how everything will turn out. All of the characters in this novel have distinct personalities, and they were all carefully developed, and done so in a great way. There wasn't too much time spent on character development, there was a perfect mix in my opinion. It flowed well with the telling of the story. Lila, the main character, is extremely relatable and likable. I think all readers would be able to see a little of themselves in her -- male or female. This is a perfect Holiday read. With it getting cold out, and snow falling in various places, curl up on your couch with a cup of coffee or a glass of wine and enjoy this great story. 5/5 stars. It was sad; it was funny; it was great! I really enjoyed reading this, and I would love it if there were a sequel, though I feel the ending for this one was perfect. I was always rooting for Jake and Lila, though I had my doubts at certain times. I was really happy when the plan for the cafe worked out. It was great.